My interest in Phoenix history has taken to to some fascinating places, often with experts who know all about stuff. And the more I learn, the more I learn how ignorant I am. 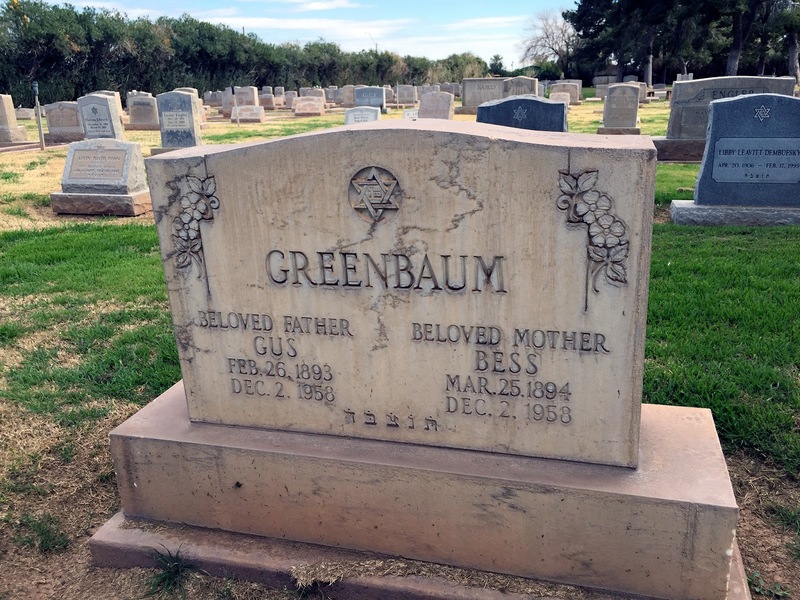 If you know all about Gus Greenbaum, you already know why the marker at the Beth Israel Cemetery has the same date for him and his wife Bess, December 2, 1958. They were murdered. I'll tell you what I know, which isn't much. You can find a LOT of information out there, as this is a connection to True Crime in Phoenix, going back to the days of Prohibition. As a volunteer for the Pioneers' Cemetery Association, I am able to connect with a lot of great experts in Phoenix history. I'm mostly interested in collecting old photos of Phoenix, and how people lived, but it's also important to know how they died. Let's go to the Beth Israel Cemetery, which is on 35th Avenue and Harrison (just north of the railroad tracks, between Van Buren and Buckeye Road). The Pioneers' Cemetery Association, by the way, is interested in all of the cemeteries in Arizona, and there are a lot of them. So I was just riding along. I don't know much about cemeteries, but I know that even the smallest ones can be very difficult to find people in. So if you're lucky, someone will be around to show you where a particular marker is. The bigger cemeteries have maps, and roads to drive around on, but the Beth Israel Cemetery is small enough that the caretaker walked us over to who were looking for, which was Phoenix pioneer Michael Wormser. And then the caretaker said something about a marker that had matching death dates for both people buried there. I don't recall if he knew the whole story, but I'd never heard it before. It was in all of the papers, but I wasn't around on December 2nd, 1958. The double murder happened in the Encanto neighborhood of Phoenix. True Crime aficionados know where the house is, and I've had it pointed out to me (although since it's a private residence I'd rather not give the address here). I was at the Beth Israel Cemetery a few weeks ago, and I looked at the marker again. Everything there is so peaceful and quiet. And if all you see is Beloved Father and Beloved Mother, and the matching death dates, it can make you curious to learn more.